The newest addition to Rainbow Six Siege? Loot boxes! There's a brand new update for Rainbow Six Siege, and it's bringing the loot boxes that Ubisoft has been talking about for a while. Title Update 2.1.1 went live yesterday, and it is intended to fix a few gameplay issues and add "Alpha Packs." Alpha Packs will introduce what Ubi calls a "chance-based loot system," and will include past cosmetics and exclusive Legendary tier items that will only be available in these packs. Ubi is giving every player on Alpha Pack when they become available on your platform of choice. If you haven't seen the packs yet, it's likely because Ubi is staggering the rollout. The company says this is "an effort to ensure the most stable deployment possible." 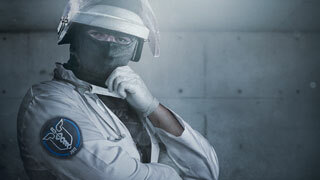 If you've got questions about Alpha Packs, Ubi plans to publish a blog post with more information sometime next week. Also included in this update are bug fixes for Hibana's X-KAIROS launcher, the Kanal spawn kill exploit, and the walls in the Blue Bar of Coastline that are "not responding to destruction properly." You can find more information about these fixes, and all the info currently available on Alpha Packs, in Ubi's official blog post.